My day starts usually at 5:45 am these days due to the sun deciding to blind me. So, when I am suitably conscious I have to admit, I do reach for my phone, but it is my clock. I lie there, contemplating the day, trying to understand the meaning of why we are here, either that or I’ll play Words with Friends, (usually it is Words with Friends!) So, after I have played my few games I get out of bed and get ready for work. After the working day is done, made lots of Huawei converts (well 4 today!) it is through showing the device and being so passionate about it that helps. The pictures I’ve taken WOW a lot of the people. These are pictures I have taken during a walk through a local garden recently and people just look in awe. These are those pictures I show. Before I head home I have to try the new ice cream store nearby. (Well, I choose too!) 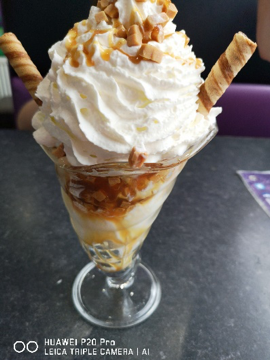 And obviously, try out the camera on the sundae I buy. Alarm set (don’t need it though, stupid sun!) – goodnight world today has been a good day!